Cooking chicken barbecue is little tedious because you have to endure the smoke and heat over a charcoal grill. Although this is the best way of cooking chicken barbecue to add savor to the chicken compared to grilling it over electric grill or gas fired grill, it is not very convenient. And the only option of cooking it is outdoors. But there is more convenient way of cooking chicken barbecue by using an oven. 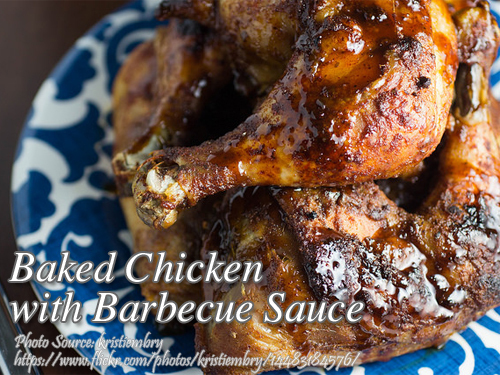 You can cook baked chicken with barbecue sauce using you oven without the mess of a charcoal grill. The cooking process is simple, just marinate the chicken in a barbecue sauce mixture (see recipe below), boil it for a few minutes, then bake it. There is also an alternative if you don’t have an oven, you can steam bake it. Though the chicken baked in an oven is more attractive, it is just as delicious when steam baked in an ordinary wok or pot with a tight cover. Cut chicken into big pieces. Mix the barbecue sauce ingredients in a bowl. Marinate chicken in sauce for 2 hours or more. Boil chicken in marinade for 10 minutes. Drain. Bake in preheated oven (300 °F) until brown, occasionally brushing with melted butter and barbecue sauce. Thicken sauce with a little cornstarch (dissolved in water). When serving, top baked chicken with this sauce. Garnish with spring onion or parsley. Hi Mrs Fely Liton, just subscribe to our mailing list and you will receive an ebook.